Control your whiteboard anywhere within your classroom with the help of the MimioPad 2 Wireless Tablet. It comes with a wireless USB receiver that automatically communicates with your MimioTeach System which translates to simple MimioStudio toolbars and menus that are same for both products. So when the lessons are flowing and your students are excited, be on the move with the MimioPad 2 Wireless Tablet. You can move around and check or focus your attention on individual students and manage your entire classroom easily. 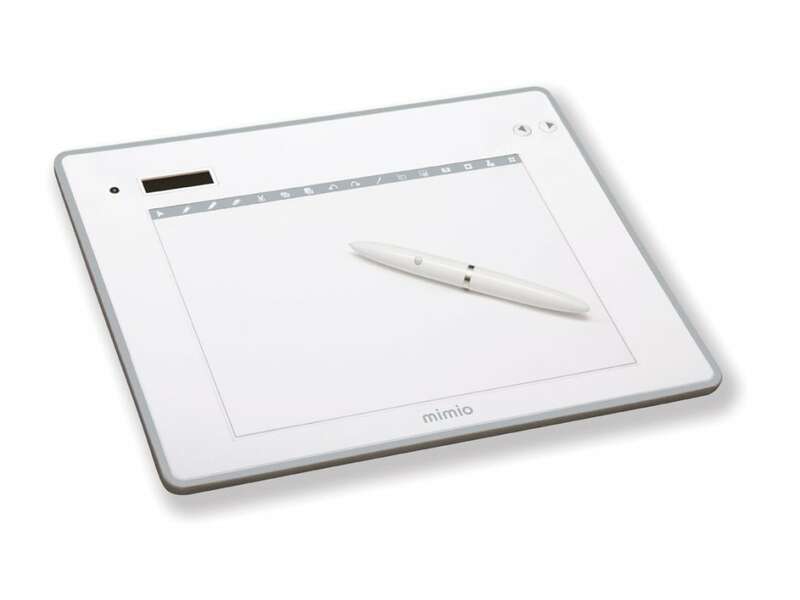 With multiple tablets able to connect to a single computer, you can allow your students to use the MimioPad2 to interact with the whiteboard without having to leave their seats, this is specially helpful to students with limited mobility or handicapped. Designed to be user-friendly and easy to carry, the MimioPad2 tablet is shaped to fit snugly in your hands, so carrying it around feels natural. The collaborate feature of MimioStudio software allows teachers to conduct collaborative activities using the MimioPad tablet or mobile devices equipped with the MimioMobile app. Quick shortcut keys on the MimioPad 2 screen provides easy and fast access to MimioStudio software tools. How does the MimioPad 2 work? Turn the tablet on and you can instantly take control of your whiteboard from anywhere within your classroom. Sit, face and walk anywhere you like up to 9 meters or 30 feet away from the receiver. Perform tasks such as writing, pointing and clicking on your tablet with the MimioPad Two stylus. Tablet Weight 0.65 kg (1.43 lb.) with battery. Complete Packaged System Weight Weight 1.15 kg (2.5 lb) with tablet, styli, cable, and battery. Electromagnetic pen (optionally tethered to Tablet) is powered by single AAA Alkaline or Rechargeable battery (included). Moving pen over tablet active surface hovers the cursor over the desktop. Touching pen tip to Tablet active surface is Left Click. Buttons on pen initiate Right Click with touch or from Hover. 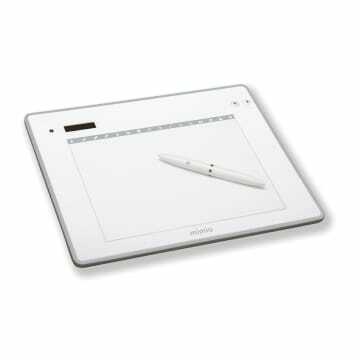 16 Icon Shortcut Keys at top edge of Tablet Active Surface area activate mimio Tools functions. 2 Buttons active Page Up/Page Down functions. LCD display (1.5" x 0.6" • 3.8 cm x 1.5 cm) indicates Battery charge status, wireless link and device ID. 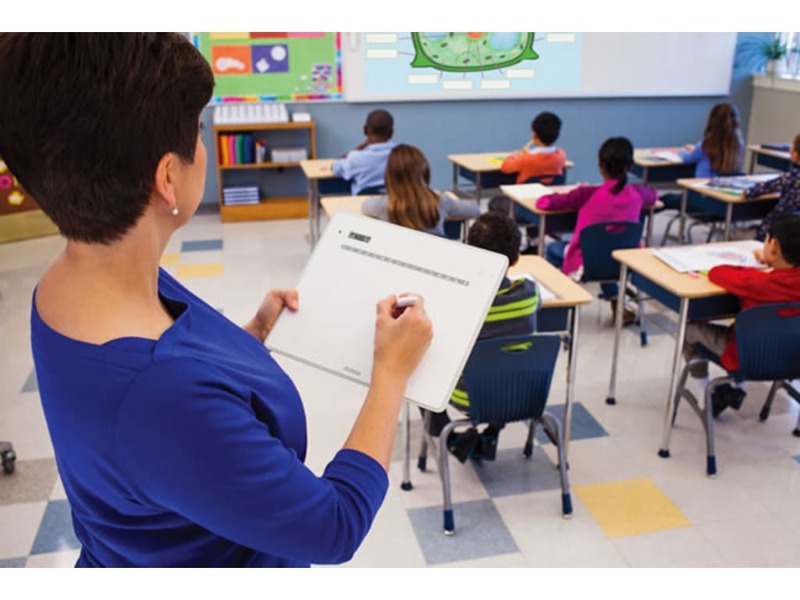 Use with Interactive Whiteboard Mimio Pad can be used as a stand-alone interactive device or in tandem with an Interactive Whiteboard. If used with a mimio Interactive Whiteboard system both devices can be supported an used from a single activated installation of mimio Studio software. Multiple Devices Up to 50 mimio Pads can be supported from a single mimio Pad wireless receiver. Each device will be assigned a unique Device number displayed in the LCD panel on the Tablet. mimio Pad can be "re-paired" to another or separate wireless receiver to return to independent use. Computer Interface – RF Wireless RF wireless interface employs a 2.4 GHz bidirectional, point-to-point, wireless interface between the MimioPad USB-connected receiver on the computer*. Utilizes direct-sequence, spread-spectrum transmission protocol. USB Cable – “micro-B” 5-pin male cable to female receptacle on MimioPad. Standard USB connection to host PC to recharge battery and use without wireless receiver. Minimum Software Requirements MimioStudio 10* and higher on a Windows, Mac, or Linux OS. For specific system requirements, please visit mimio.com/support/downloads. Q: I want to order this and it would be my first Mimio product. Would I be able to use it? 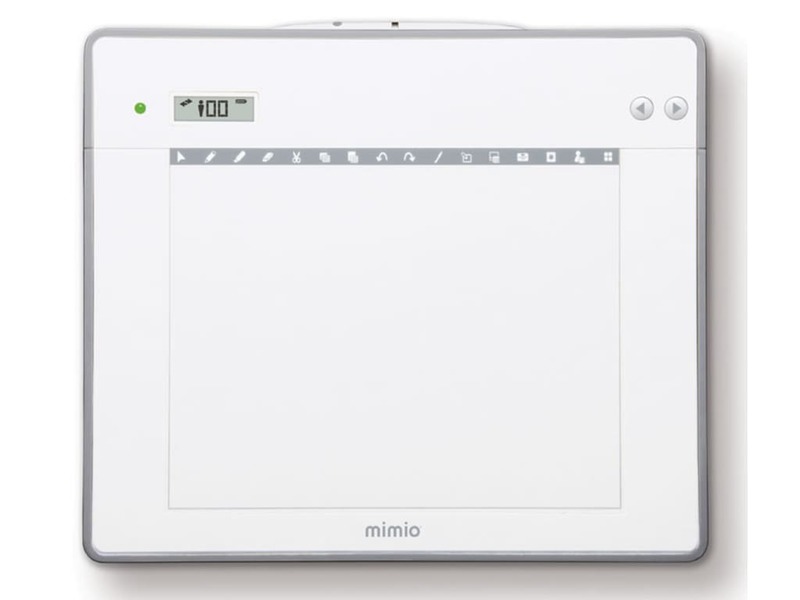 A: Actually no, this Mimio Pad does not include a wireless receiver or software. If you have the Mimio Teach, you can use the receiver and software that came with the Teach. If you don't have a Teach, please contact us and we can configure the best solution for you. Q: Does the MimioPad wireless tablet work with the other MimioClassroom products? Q: I use both a PC and a Mac; can the same Mimio hardware be used on both? Is there also software for each platform? A: Yes, the same Mimio Classroom products can be used for both PC and Mac. Q: What is Writing Recognition software? A: The Writing Recognition feature within Mimio Studio can be used to convert live writing into editable text (to enter text into applications during interactive use) or as a post-processing tool to convert previously written notes into editable text in a Notebook file. There are two Text Tools within mimio Studio which support live writing conversion: Write Anywhere and Writing Pad. These tools can be selected by right-clicking on the Text Tool icon in the Windows notification area in the lower right corner of the screen.